A man in Zhejiang Province, China had to be carried out of a net cafe after losing feeling in his legs following a marathon gaming session. According to QQ (via Newsweek), the man didn't take a break during a reported twenty-hour gaming session. When he tried to get up to go the restroom, he discovered he was unable to move from the waist down. "It seems he had lost sensation completely and couldn't move at all," a friend is quoted as saying (via Newsweek). "We had to call for an ambulance." 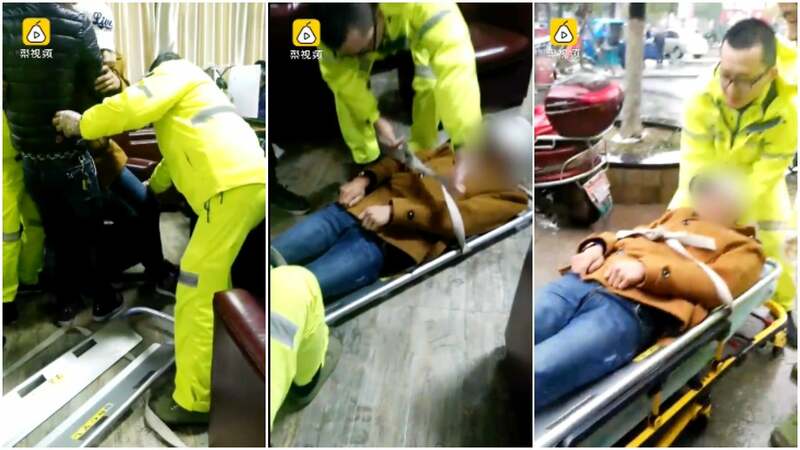 In a video posted to Chinese video platform Pear, paramedics can be seen carrying away the man, who keeps saying he wants to finish his game. Pfft. Amateur. Needs to have trained up on more WoW expansion launches. I can barely last 2 hours without getting up and taking a pee, WHAT is wrong with these people? IRON bladders? their probably dehydrated as to prevent this which actually makes the whole blood circulation situation worse! Why do you need to pee so much? Because he/she probably does this thing called "keeping hydrated"
What is wrong with the world, Go outside once in a while, Take a break, Kick a balk around with your dog, Appreciate the small things in life so if you ever had a legitimate accident & lost the ability to walk.. Fk ppl are really dumb sometimes. I don't like balls or dogs. Why can't I do with my body as I wish? I could easily say what's wrong with you wasting your time with a stupid ball and dog. You should get onto a computer and learn some skills on there once in a while. Appreciate the more complex side of life. I'm a mechanical engineer, You look like an idiot now :). That is called spoilation of evidence. Your statement is errant and invalid. I saying i'm an engineer without providing evidence of the fact doesn't count as spoilation of evidence, One this ain't a court, Two this is a website. Your statement is wrong & invalid, You also don't seem to understand what "errant" means.. You tried to sound smart, You failed, It's like you came to early without thinking things out. I will have a good day. If you replace the word gaming with masturbation the article becomes a lot funnier. Bladder distension, pressure sores, constipation, permanent nerve damage are just a few of the problems he would have caused his body. Probably playing on a hard surface chair, got extremely uncomfortable but ignored it and hammered on. The man's an idiot but I'm surprised the establishment hadn't picked up on it sooner. Honestly, there are clearly additional underlying medical problems this man had. Once again, the media cherry picks information to point the blame at video games and continues to call them dangerous. I have sat in a challenge for 24 hours playing Fallout 4 with just two washroom breaks spaced 10 hours apart. The only thing I felt was eye strain. I am in nominal shape and health, and can assure all of you, this man was doing something outside of video games to cause this. Perhaps his belt was too tight and cut off bloodflow to his legs. This could happen while watching TV at home, or long hauling for a trucking company. Do not blame the video games. Blame the individual.